The story of how an offhand remark on Twitter resulted in a Michelada Throwdown at Anvil Bar & Refuge. One of the more interesting developments in the last few years is how people use social media sites like Twitter to discuss common interests and then meet IRL (in real life) to explore those interests. A recent event organized by a loose group of Houston foodies, chefs, bartenders, and bloggers is a perfect example. The genesis of this event is a fascinating look into how social media can be used in a seemingly haphazard and impromptu way to create a snowball effect of buzz and interest. And with most social media-generated events of this type, it began with a completely offhand remark. Offhand Twitter Remark. Snowball Effect. Meme Created. The event is a “Michelada Throwdown” that will happen at Anvil Bar and Refuge in Houston at 5pm on Sunday, May 24th. The event will feature well-known bartenders and chefs creating their own versions of that venerable Mexican adult beverage, the Michelada. And with that seemingly innocuous tweet, a Twitter meme/movement was born. Over the next few days the snowball effect took over and the Michelada convo gained traction. Other Houston food tweeps joined the conversation: @viva_victoria, @esandler, @theoshu, @treelight, @EatingOurWords, and yours truly @houston_foodie. @ruthiejsf would eventually write a blog post Michelada Me, Baby documenting a trip to Taqueria Arandas to satisfy her Twitter-inspired craving for Micheladas. 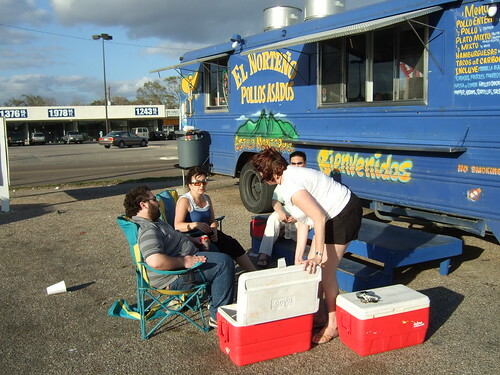 For a small group of Houston food lovers, Micheladas and the New Flea Market hold a special place in the pantheon of Houston food adventures. And it all started with a taco truck crawl some months before. Taco Truck Crawl. New Flea Market. The Dead-Enders. The New Flea Market on Long Point Road in Houston is a wild-and-wooly bastion of Hispanic American-inspired capitalism. Housed in a gigantic barn-like structure in an even more gigantic parking lot, the New Flea Market specializes in selling, among other things, lots of jewelry sold by Asian Americans to Hispanic Americans, garish T-shirts, belt buckles, cowboy boots, DVDs and music CDs, haircuts, tires, and the occasional fake ID. Along the back wall of the building is a string of Mexican restaurants and churro stands which seem to be a favorite target of the city health department. And that is just inside the Flea Market. Outside in the parking lot is an even more chaotic atmosphere where homemade goodies and products of questionable provenance (CDs and DVDs primarily) are hawked with the fervor of a Middle-Eastern bazaar. Back in February, the Houston Chowhounds, a group of food lovers dedicated to exploring the culinary delights of Houston, organized a crawl of several prized taco trucks. The final stop was the well-known El Norteño taco truck which is actually a big blue bus and is known for pollos asados — roast chicken — rather than tacos. It also happens to be parked in the New Flea Market parking lot. A wonderful time was had by all and everyone left stuffed to the gills with tacos and roast chicken. However, as often happens with a Chowhounds event, there will always be a small group who stay long past when the others have left. I affectionately refer to this rotating group of members as the dead-enders (I’m usually one of them). We refuse to go home. We refuse to give up. There is always one more dish to eat, one more restaurant to visit, one more drink to swill. “I dare you to eat one more taco” is a typical challenge. It is a hilarious, dizzying culture of culinary one-upsmanship. And for those in the know, it is indeed only after the official event is over and only the dead-enders are left that the real fun begins. For this event the dead-enders were myself, @viva_victoria, @esandler, @collierchin, and @jodycakes. After a final round of tacos, chicken, churros, and raspas, we ventured inside the Flea Market for the final adventure — authentic Micheladas at one of the restaurants lining the back wall of the building. It was a Saturday so the places were packed (everyone Mexican American) and soccer games were blaring from overhead flatscreens. All of the customers were sipping Micheladas. 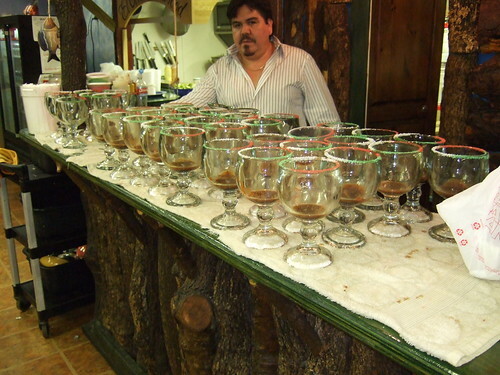 We picked a place called El Oceano that had Michelada glasses lined up on the bar. We ordered a round. The waitress and owner were very accommodating. They even sent over a batch of complimentary seafood tostadas which we ate heartily, health department reports be damned. As for the Micheladas (which we can only assume to be completely authentic considering the surroundings), they were, let’s just say, memorable. The flavor of the Tabasco, Clamato, and/or Worcestershire sauce was intense and completely overwhelmed the beer. Some in our group sipped tentatively, others gulped it down. Either way, we were all hooked. Micheladas were in our future. As we left the New Flea Market for good, we got an order of churros to go. Double Dog Dare. Twitter Harassment. Challenge Issued. So back to the current Michelada mania on Twitter. The New Flea Market Michelada veterans ratcheted up the pressure like any true Chowhound would. @esandler fired the first volley. Invoking the wildly popular new bar Anvil, he wondered if the Anvil mixologists could come up with an artisanal version of the Michelada. Anvil is known for making old-style, Prohibition-era cocktails, made from scratch and with an obsessive attention to detail and craft. @psandalio, perhaps smelling blood (or at least Worcestershire sauce), immediately dared @esandler to order a Michelada at Anvil. Later that day, @viva_victoria cheekily pushed the action by calling for a Twitter campaign to get @bobby_heugel, one of the owners of Anvil, to come up with his own version of the Michelada. A possible visit to the Flea Market was indicated. After two days of intense lobbying and convo, @bobby_heugel enthusiastically agreed. But that wasn’t the end of it. In true Houston foodie and Chowhound fashion, @bobby_heugel threw down the gauntlet to @psandalio to come up with his own version of the Michelada and bring it to Anvil for a side-by-side comparison. It’s on! @psandalio agreed to the throwdown. In the following days, as the snowball kept rolling and the buzz kept building, several other notable Houston chefs/bartenders signed on to bring their own version of the Michelada. And of course the Chowhounds, led by @esandler and not content with just one stop on a Michelada Sunday tour, organized an all day Michelada crawl to several of Houston’s best known Michelada sources — Connie’s Seafood, Teotihuacan, and Taqueria Arandas. But the real question is, where will we go after Anvil? This entry was posted in Blog Only and tagged anvil bar, bobby heugel, michelada, twitter. Bookmark the permalink. Hahaha! This is hilarious and nicely documented. I am *so* sad to miss the throwdown today and will expect a full report here. ENJOY! This is the great thing about Twitter that those that look down upon it will never understand. The real time connections that you can make and how quickly it can turn into something magical. Have fun today! It’s seems rather fashionable for some people to denigrate Twitter now (as it has expotentially grown), so it’s nice to see a positive and coherant encapsulation. awesome write-up. sad that the timing of the event was all wrong for me, but i had a great time at the throwdown anyway. It was a great time. Lots of unique Michelada’s out there.